Just a former schoolmarm who is angry and grieved over the ways of the world. Though I'm 72, I cannot turn into a sweet little old lady. Hard cheese!!! On 24 April 2017, the Sultan of Kelantan, Sultan Muhammad V will be installed as the 15th Yang di-Pertuan Agong of Malaysia. 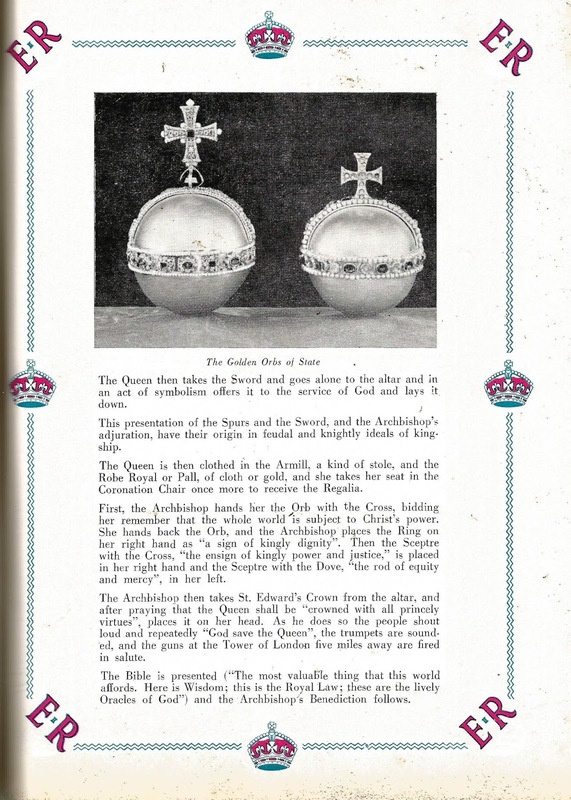 This occasion is described as an 'Installation' and not a 'Coronation' (from the word coronet which is also a crown). Part of the Yang di-Pertuan Agong's Regalia is the Tengkolok di Raja (a traditional head-dress) and it does not include a Crown. Malay Sultans are not crowned (except for the Sultan of Johor). After 73 years, (although I spent my first 63 years as a citizen of the Republic of Singapore) I am just getting acquainted with the whats and whys and hows of this unique system of Constitutional Monarchy. I am just beginning to come to grips with the history and legacy of the Lingga-Riau Empire. Their Royal Regalia is similar to that of Malaysia's Paramount Ruler specifically items like the Keris and the Cogan. More fascinating for me is the Nobat di Raja. Here's a video of Perak's Nobat di Raja at practice. 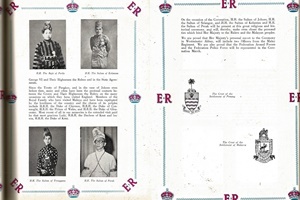 For a short spell when Singapore was part of Malaysia in the 1960s - Singaporeans faced the prospect of having a Monarch: a Sultan who is a Malay-Muslim and carries the nomenclature of Yang di- Pertuan Agong as the Head of State. The closest thing they could relate to a "Sultan" is Masjid Sultan or Jalan Sultan, where Malays and non-Malays would flock to for Malay and Indian-Muslim culinary delights during every Ramadan. As for Johor, it is the nearest neighbour with a Sultan, but Singaporeans were not too impressed with the 'stories' regarding the then Sultan of Johore. From September 1963 to August 1965 ( which coincided with my sojourn at the University of Singapore ) we sang Negara Ku as our National Anthem. The line "Raja Kita Selamat Bertakhta" carried no significance for us and we could not connect with the institution of the Yang di-Pertuan Agong in Malaysia. But then, Singapore's very own National Anthem Majulah Singapura was sung with gusto at every morning Assembly in schools, and when a pupil was asked the title of the Anthem, he happily gave the answer "Mari Kita" (the Anthem's first two words)! In Singapore, Malay might be the National Language (then), but it carried no kudos and no significance. Besides, Malay schools were flagging in their enrolment (like some vernacular Chinese schools in Malaysia today) and were left to die a natural death, especially after August 1965. When I was teaching at Sekolah Menengah Yusof Ishak in the late 1960s, I met a number of pupils who, in their 4th/5th year at Kampung Jagoh Malay School (Telok Blangah Road), had to menumpang at Jubilee Malay School (off West Coast Road) when their school enrolment reached a critical level. By the 1970s/1980s Kampung Jagoh Malay School and Jubilee Malay School ceased to exist. As they withered away, there were no voices that would or could whimper and mourn their demise. Interestingly, Dr Toh Chin Chye (1921-2012), a founder-member of the PAP, and a former Deputy Prime Minister (1965-1968) wanted the Anthem to be in Malay "as this is the indigenous language of the region " and it would "appeal to all races". A whole lot of water has flowed under the bridge since then!! In 2001, the Anthem was re-arranged by Mr Phoon Yew Tien in "the musical key of F". This arrangement was "grander and more inspiring" in order to make the anthem "more accessible to all Singaporeans". During the courtship period between Singapore and the Federation of Malaya, I recalled an incident that stuck in my psyche - that convinced me that this "arranged marriage" would not work. One party was chalk, the other was cheese. More than that, the agenda - implicit and explicit - for the merger was fraught with duplicity and opportunism. I was with some of my fellow undergrads in the Union House canteen chatting about the hottest topic on the campus - of Singapore in Malaysia. I was the only Malay in the group. One of the boys cheerily quipped, "Yah man, we shall have AH GONG as our Head of State!" They were beside themselves with glee and cackle - except Maznoor bt Abd Hamid! After that startling revelation, I wrote an article for the Bulletin of the University's Democratic Socialist Club entitled 'SULTANS : AN ANACHRONISM? ', I wish I had kept a copy, but in those days we were still using dinosaur technology. In a nutshell, I stated that Sultans, like the British Colonials and the Chinese tycoons, have a place in the political makeup of the country - and especially the Sultans. If they had not been conquered, conned and cajoled (and sometimes connived) into opening up their States, there would be no Singapore or Malaya or Penang. Just as the British Isles is the United Kingdom, 'Government' in Malay is translated as Kerajaan. Very flimsy ground maybe, but there's a limit to the insults and encroachment that the Malays can take. When Singapore joined Malaysia, it became obvious that the main thrust of the PAP's agenda was to agitate for Malaysian Malaysia. It was a glib and disingenuous mantra, which sounds like one thing, but it means another. Today, though differently packaged it is still part of the agenda of the DAP, a clone of its cousin in Singapore. So why did I write that article? I am no great fan of Royalty, local or foreign. They were only characters in movies like 'Hang Tuah' (re the self-indulgent, unjust and effete Sultan) and 'Bawang Putih, Bawang Merah' (this time the handsome prince, which many red-blooded damsels dream of marrying). Titles like Tengku or Raja or Syed for that matter do not leave me in awe. But, enough is enough - just how many more apples do they want to pick off the tree?? I reckon there are some in Malaysia who will snigger, mock, ignore or at the very least tolerate this Royal ceremonial event that takes place every five years. However this septuagenarian remembers how Singapore and the Federation of Malaya went to town to celebrate another particular Royal Event. 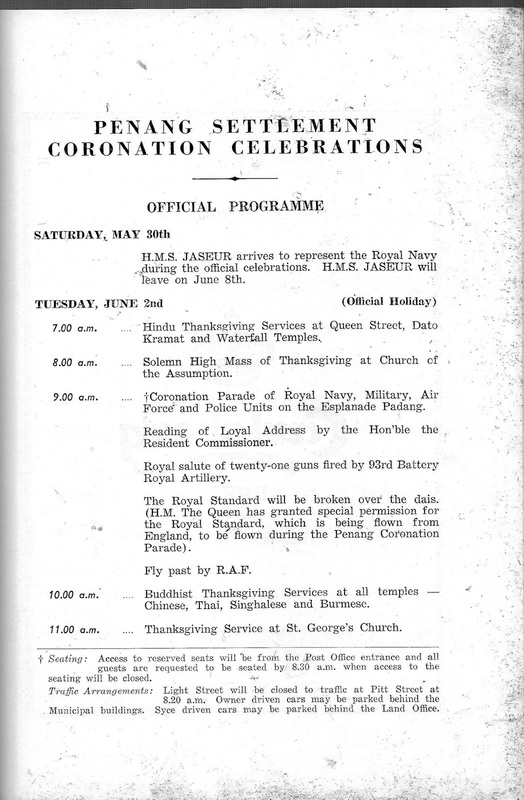 Here are some images from the "Penang Settlement Coronation Celebrations" of June 1953. 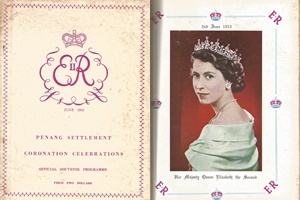 Her Majesty Queen Elizabeth the Second and the Penang Settlement Souvenir Programme. 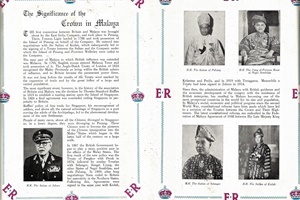 The pages relating to "The significance of the Crown in Malaya" indicates that the nine Malay Rulers are only entitled to the appellation 'His Highness', not HRH ('His Royal Highness). Mere titles they may be but it still reveals the pecking order. Malayans then were quite at ease and happy with this version of imported Royalty and feudalism. How different should they be today? The Nine Sultans - His Highnesses taking their place in this Ceremony. 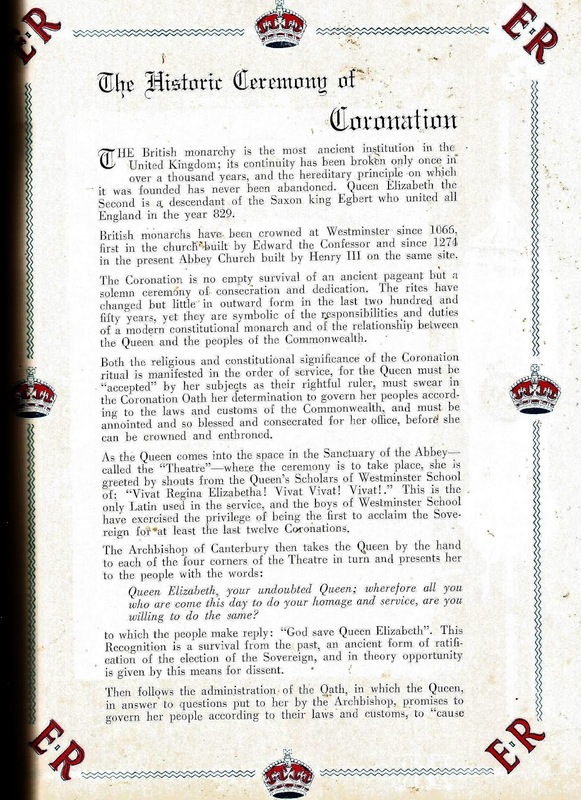 The following extracts describe the 'Historic Ceremony of Coronation'. "holy oil from the Ampulla which is poured into the Anointing Spoon". 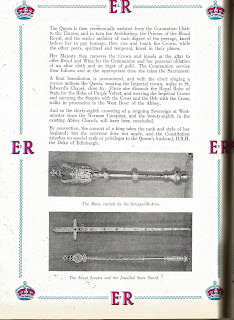 And we were informed by our teachers that this means " she is blessed and consecrated as monarch and made ready to receive the royal vestments and regalia, the outward symbols of her office". 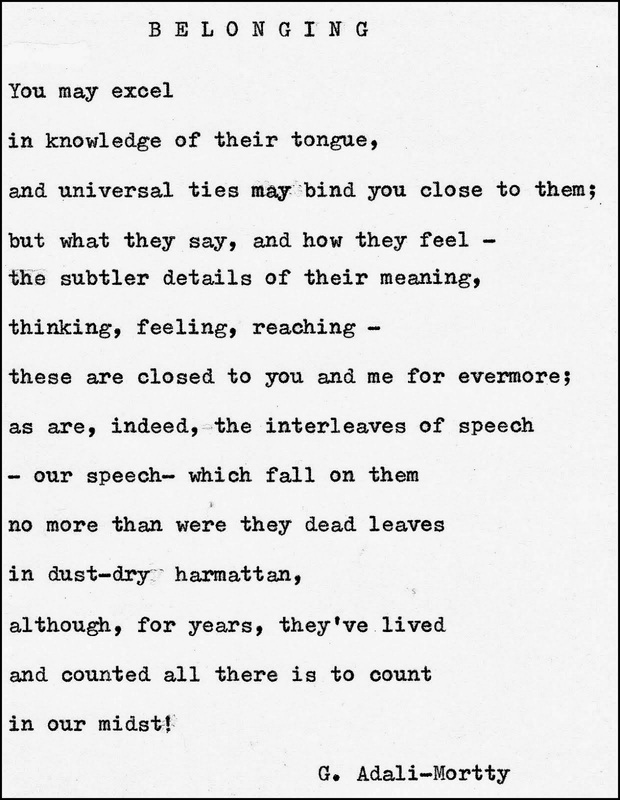 We hung on to the words to imagine all these rituals taking place. I remember being quite gobsmacked ( though that's not the right word for 1953) and we little brown children of the British Empire sat there on the floor with glazed eyes and (some) open mouths. But I must admit most of that pomp escaped us and all we wanted was the Coronation souvenir badge. Now that I am 64 years older I find these parts of the Ceremony quite fascinating. 1. 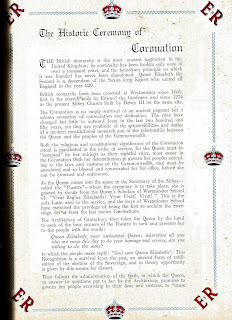 Then follows the administration of the Oath, in which the Queen, in answer to questions put to her by the Archbishop, promises to govern her people according to their laws and customs, to "cause Law and Justice, in Mercy, to be executed" and to uphold the Protestant faith. 2. The Queen then takes the Sword and goes alone to the altar and in an act of symbolism offers it to the service of God and lays it down. 3. The Bible is presented ("The most valuable thing that this world affords. 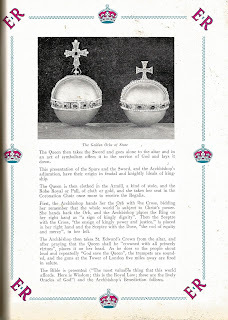 Here is Wisdom; this is the Royal Law; these are the lively Oracles of God") and the Archbishop's Benediction follows. Certainly the Yang di-Pertuan Agong's Installation won't be as complex and ostentatious and magnificent and sumptuous and showy as the Coronation of a Christian British Monarch whose reign covers half of the globe. Malaysians who prefer to be Republicans can take comfort from that difference! Finally, how did the Rakyat in Penang celebrate that joyous day? 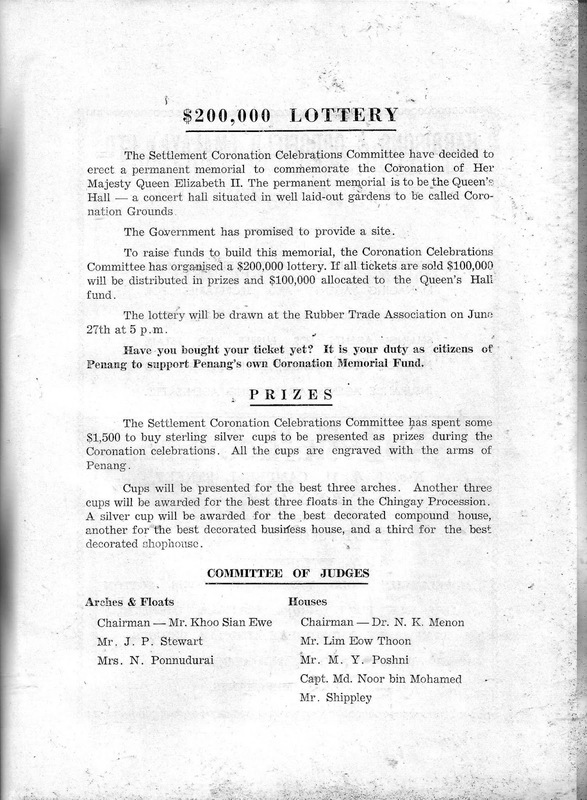 That lottery is for the construction of a permanent memorial, a concert hall named Queen's Hall in Coronation Garden. What is $200,000 worth in today's money? The intent of this posting - nine Sultans taking turns to be the Yang di-Pertuan Agong is simpler (and more interesting) than having a permanent lifelong monarch. Every nation needs a figurehead Head of State. 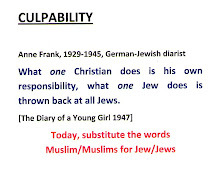 For the Malays - whose economy, demography, government and culture have been subverted and muddled by the appetite of Britain and its compradores - please, please let them keep their Sultans .... and please, please save them from the Republicans, the puritan Arabists and all shades of Shakers and Modernisers. What more do the (Singapore) Malays want ? The Canonisation of Lim Chin Peng - Blood or Ideology? Babies and Missiles - America's Trump Ca(r)d.